Due to Monday 22nd April being a Bank Holiday and their being no deliveries during the Easter Break, we would like to advise all schools of a change to the advertised menu for Tuesday 23rd April. Our school provides a milk scheme that is available to all of our pupils and we would like to invite you to register your child. School milk is free for all under-fives and those entitled to Free School Meals. It is subsidised for other pupils at approximately £15 a term. Each pupil that registers with Cool Milk will receive a carton of semi-skimmed milk every day, which is delivered fresh and chilled to the classroom. School milk will not only provide them with essential nutrients, but it is also rehydrating and energy boosting. If your child is entitled to Free School Meals, they will receive a daily carton of milk and you do not need to register with Cool Milk. If you do not wish your child to have this milk, please inform the school office as soon as possible. Find out the top ten reasons to drink school milk at www.coolmilk.com/whyschoolmilk. Complete a registration form or register online www.coolmilk.com as soon as possible. Shortly after registering, you will receive a payment request. If you have any questions regarding school milk, visit www.coolmilk.com or contact Cool Milk directly on 0844 854 2913. School dinners are payable at a cost of £2.20 a day. If you are not entitled to Free School Meals, you will be issued with codes that enable you to log onto a website called ParentPay. Through this site, you can pay for your child/childrens’ school dinner online. Your ParentPay account needs to be in credit in order for us to let your child have a school dinner. If you have any queries with regard to paying for school dinners or if you think you are entitled to Free School Meals, please talk to the School Office. A New Way To Pay For School Lunches! School dinners at Fairlight are paid using ParentPay, an online payment system that you can log onto and then top-up with credit as you need it. Log on codes can be obtained from the school office. School Lunch Prices are £2.20 per day. It's important that you put credit onto your account in advance for your child's school meals. Any debts for school lunches which remain unpaid will be chased up. Additionally, your child may not be allowed to have school lunches or participate in clubs or trips until the debt is repaid. Many parents have asked for further support and information to help them make an informed decision around school meals. The Little Book of Goodness written by the School Food Trust is designed to address these concerns. For further information from the local authority, click here. A variety of red meat and poultry dishes all to the red tractor standard. 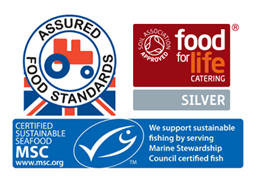 Sustainable fish including omega-3 rich oily fish. A wide choice of fresh fruit, vegetables and salad. Fresh bread, cooked on-site daily. Please see a copy of the menu below. This runs until October Half Term. Children may bring packed lunches if preferred. Information on what makes a healthy packed lunch can be found here. Child Tax Credit (provided they are not entitled to Working Tax Credit) and have an annual income that does not exceed £16,190 (as assessed by Her Majesty's Revenue and Customs). Note: Where a parent is entitled to Working Tax Credit during the four-week period immediately after their employment ceases, or after they start to work less than 16 hours per week, their children are entitled to free school lunches. If you are in receipt of any Working Tax Credit, you will not be eligible to apply for Free School Meals. Do we get free meals? If 'yes' you must register at the 'Office'.